Okay, technically they are Cretaceous (since that is the period when raptors lived), but it is really hard to come up with dinosaur-shoe puns! 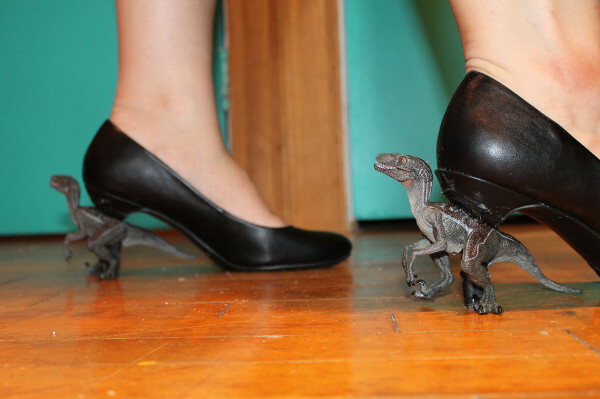 One night last week, I saw awesome dinosaur heels on The Mary Sue and I got really excited when I saw that they were DIY. But to my dismay, they weren’t very DIY unless you were a shoe cobbler with welding equipment. 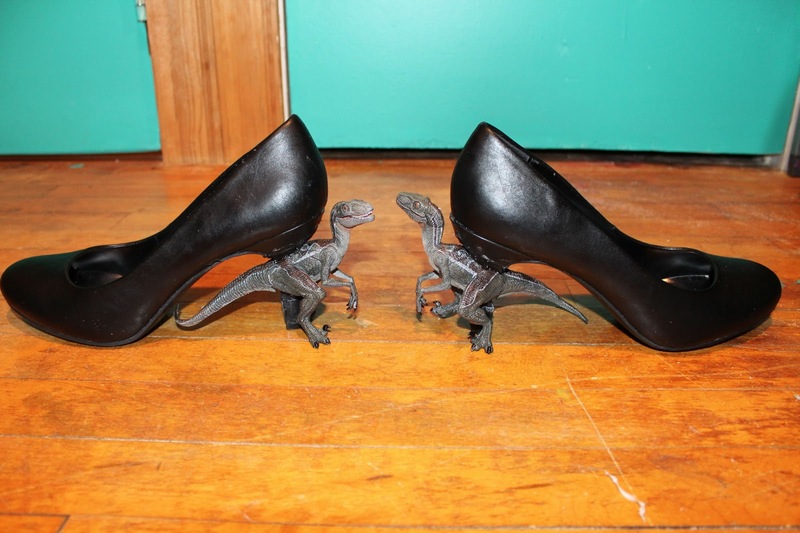 I went to bed that night running through ideas in my head of how to make my own dinosaur heels! I decided to go for it without welding equipment. First, I needed to pick out the dinosaur I wanted to use. I needed one that was bipedal (stands on two legs) so that the tail would be tucked under the sole and not be in the way. I went online and ordered Papo Velociraptors because Papo makes the best toy dinosaurs. The detail is fantastic, and the quality is unmatched! Now all I had to do was wait a whole TWO days for them to arrive (thanks, Amazon Prime!). Once I got them, I ran (drove) to Target looking for a heel that wasn’t too wide. There were a few stilettos that would have worked, but I hate very high heels. I decided to get crafty and bought a pair of kitten heels and used a drill to sand them down until they were the right thickness. Now, I must say, this was not easy at all. 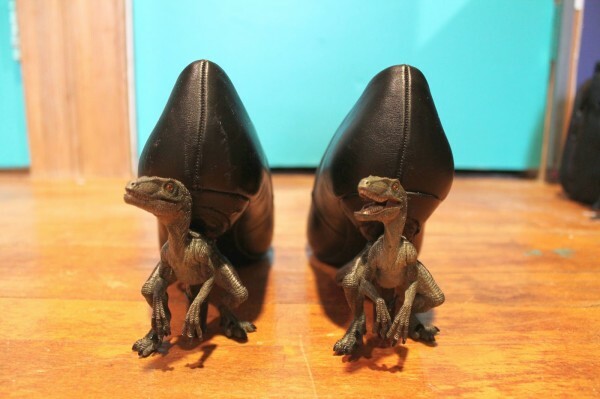 It took hours to drill the right sized hole into the raptors, and hours to sand the shoes down. But it was totally worth it! The final step was glueing the raptors to the heel and voilà! 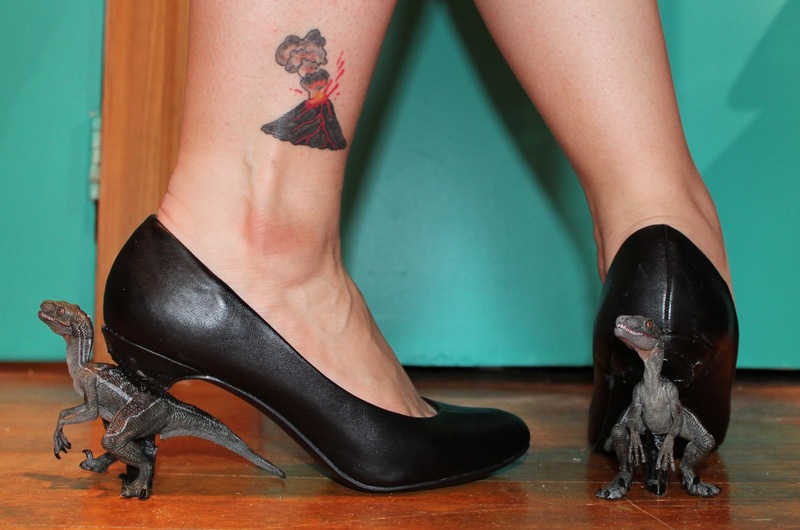 A pair of unique dinosaur heels! The best thing about Papo dinosaurs is that the jaws always move, so I can have the mouths open or closed, depending on my mood perhaps! Now, I love these velociraptors. They are great and look just like the ones in Jurassic Park. I would love it if they had feathers, but I cannot fault a design made before the 2007 discovery of quill knobs on a Velociraptor’s forearm! But that is not the only scientific inaccuracy in the design. The main blunder is that these are modeled after a raptor called deinonychus, NOT a velociraptor. The blame for this falls squarely on the shoulders of the Jurassic Park films. Velociraptors were small, nothing like what we see in Jurassic Park. The deinonychus is larger, and more threatening, making a better antagonist for the film. But lets face it, its name is harder to pronounce and spell. ← I am on a dinosaur kick!